Aldiko is one of the most popular ePub reading apps for Android tablets and phones and it just got updated to version 3.0 today. The 3.0 update is being rolled out to Aldiko premium users first, and then the free version will be updated in the near future. The download for the 3.0 premium version is available on Google Play. It sells for $2.99. One of the most noticeable differences with the new update is the overall look has changed to a more modern design. That’s because Aldiko 3.0 is using a holo-themed design and features a new user interface. There are also new organization features in the library as well as catalog options. A Holo-theme based, modern, and re-imagined version of Aldiko Book Reader. Providing a new way to browse and download books from catalogs with newly-added features and design such as facets and tabs. Easy and powerful library organization for users with lots of books with newly-added feature such as filter, book multi-deletion, easily accessible tabs and collections. Much more prominent access for users to add their custom catalogs. The Aldiko Team goes into a lot more detail describing many of the changes and new features over on the Aldiko blog. There are several screenshots. If you’re a fan of the app it’s worth looking over to learn some tips for using the new user interface. 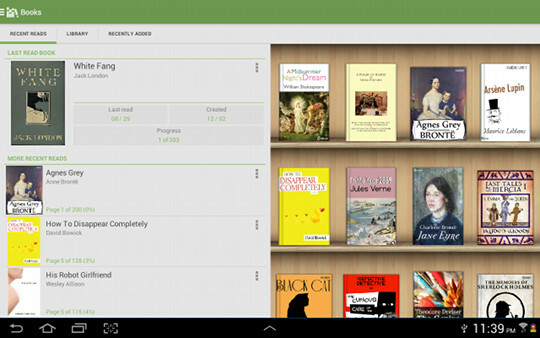 Aldiko has always been one of my favorite reading apps for Android, but I haven’t been using it much lately. It will be fun to try out this new design. I’ll try to get a video review posted later this week. The thing that drives me crazy with the .epub readers is their inability to render .epubs properly based on their style sheets. Would you be interested in a test .epub publication to try out with Aldiko 3.0? If so, then please drop me a line. I didn’t see any mention of changes in that department, so it’s likely the same as the earlier version of Alkido.